A Parents Magazine Best Book of the Year. When her sister, Clemmie, refuses to play in the rain, Matilda wants to teach her the delights of a wet Saturday. They end up learning an unforgettable lesson. Kirkus Reviews declared, "This warm and accessible story is sure to be a favorite." [A] tender, accurate depiction of sister dynamics, including the lessons they invariably learn from each other, and Liniers’s cartoon drawings capture the siblings’ distinct, expressive personalities. An up-close view of a tender sororal friendship. ... A reminder that moments of disappointment and dismay can be as intense, but also as fleeting, as a summer storm. 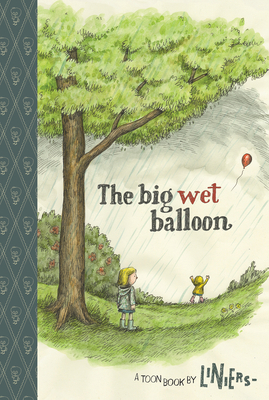 A simple, funny slice of life, The Big Wet Balloon succeeds by effectively depicting a sibling relationship and the joys of a child’s world. ... The full-color illustrations have have a sophisticated cartoon quality. Celebrated Argentine cartoonist Liniers offers a warm visual welcome to early readers in this graphic novel; lively watercolors in comic format provide plenty of memorable images and details to examine and savor. The gentle humor and mild suspense will quickly draw readers in, while brief sentences and appropriately challenging vocabulary, flawlessly interwoven with pictures that provide visual cues, leave room for readers to decipher, consider and comprehend. ... An excellent example of how well comics can work for early readers, this warm and accessible story is sure to be a favorite. Liniers tells a quiet story that taps into moments of childhood life the way that few comics manage (or bother to try), augmented by a color palette that creates a deep sense of mood, warm line work, and characters... An uncommonly family-friendly tale, great for parents to share with their kids. This adorable comic-like tale of two sisters who spend a rainy day playing outside wooed our kid reviewers because it didn’t look like a typical early reader. The level is discreetly displayed on the back. 'The story was much more substantial than other early readers, yet it used enough recognizable words for my 5-year-old to get through it on her own,' says a mom reviewer.